At this moment in the hockey world, there are fewer teams as irrelevant as the AHL’s Texas Stars. However, yesterday Andrew’s Stars Page/ESPN Dallas published a prospect update on goaltender Tyler Beskorowany that demands a response. From end to end it is an insult to the young goalie from Sudbury. The article relies entirely on quotes from Director of Scouting and Player Development Les Jackson, who repeatedly calls out and questions Tyler’s level of commitment to playing pro hockey. It presupposes an outright falsehood–that the organization has given him every chance at the AHL level, and he has fallen short. Either Jackson is wholly ignorant of the situation in Cedar Park, or he is on the receiving end of misleading or terrible information from General Manager Scott White, or he is deliberately banging the gong on Beskorowany, for reasons only he could say. It doesn’t much matter; the organization is hanging the kid out to dry and he doesn’t deserve such repulsive and shameful behavior. Granted, Jackson’s statement is somewhat confusing because the clauses don’t fully support one another. Nonetheless, it is not unreasonable to conclude the following: He is saying that Beskorowany ‘floundered’ his ‘great opportunity’ to take the number one job. In that month, the Stars played 11 games. Tyler started nine of them. Two of those wins—including the shutout—came against the pre-Matsumoto-trade Charlotte Checkers. Perhaps there is an alternate explanation for his posting a winning record on a losing team. Maybe Texas’ offense was firing on all cylinders? Averaging 2.7 goals per game, I say no. 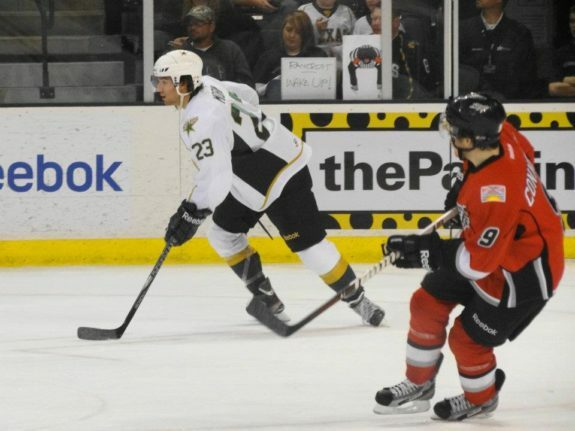 That month, every road broadcaster inevitably gushed about the Texas Stars power play. So maybe the kid was its great benefactor? He was not. The team was 3 for 38 in those games, or eight percent (generously). Meanwhile, the penalty kill, where there is no more important player than the goalie, was 26 for 29, or almost 90 percent. 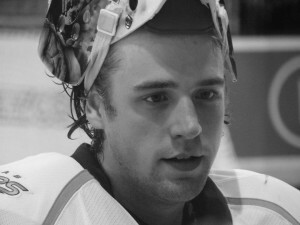 By January, Kari Lehtonen had returned to the Dallas roster. Bachman stayed as the back-up, and Andrew Raycroft, despite being in the second and final year of a (now) one-way contract, was sent down to Texas. Beskorowany was putting up good numbers on a bad team. Yet with Raycroft’s arrival he suddenly found himself on the bench. Inexplicably, Raycroft was handed the reigns on arrival, starting 11 of the team’s 12 January games. Why, when no one in the organization could have possibly had any confidence in him? The no-confidence vote began the year before, when then-Dallas coach Marc Crawford had so little confidence in Raycroft that he felt he had to start Lehtonen in 33 of the team’s final 34 games. Why, when Beskorowany was playing well, and is a second-round draft pick, and is a team prospect? Most of the what? The night he was quoted, his record was 0-5. He spun it into a 2-8 record, and flunked out of the NHL. In Cedar Park, Raycroft put on a display of incredulous indifference and outright disrespect for the fans, his teammates, and the AHL. Unlike Jackson, I was at every home game and I watched each road game. He was as unhurried a goalie as I have ever seen. Urgency? Never. His lateral movement was not even true lateral movement, it was just the momentum he gained from having dropped into a butterfly well ahead of the play and glided across the crease. He frequently rested his glove arm on the crossbar, not in a Ken Dryden or Patrick Roy style mind-game but in an I’m-better-than-all-this bit of posturing. Evidently, earning $650,000 in the AHL is exhausting. When on the bench, Raycroft wore a cap pulled low enough that you would have been forgiven if you thought he was catching up on his six-figure sleep. Raycroft started 21 games. His 9-10-1 record belies the fact that Beskorowany had to relieve the porous and ‘leepy Andrew four times in an 11 game span. According to a reliable source associated with the team, Raycroft was getting starts not because coach Jeff Pyle made the call, but because GM Scott White did. If true, it’s hard not to wonder why White was so enamored of Raycroft–or so unimpressed with Besko–that he would meddle with it all, especially for those of us who are wholly unimpressed with White. No joke, many Texas fans await July 1 for no other reason than it spells the end of Raycroft’s contract. Yet the number one role in Cedar Park next season is both predetermined and not named Tyler: the job is Jack Campbell’s, and it’s not even his to lose. The organization, with Kari and Richard in tow, is embarrassingly giddy for Jack. That Les Jackson would even pretend otherwise, and hint that Tyler has a shot provided he work hard this summer, is the final arrow. One year remains on his entry-level contract. Whatever happens then, he deserves better than this. Whether next season he is better served backing up Campbell in the AHL, starting for Idaho in the ECHL, or being somewhere else altogether, I don’t know. Unfortunately, I question whether the organization knows either, or that beyond the empty call-out, it really even cares.